February is the month for ride-sharing (probably for the nth time since last year). Two new aggressive startups in Asia raised massive fundings -- China’s Ofo, a bike-sharing company and a close contender to Mobike, raised $450 million from DST Global, Didi Chuxing and CITIC; and India’s cab-sharing startup Ola raised $330 million from SoftBank. Sitting on top of the deal list is Chinese search giant Baidu’s video-streaming service iQiyi, which raised $1.53 billion from its parent company and three notable venture capital firms -- IDG, Hillhouse and Sequoia. 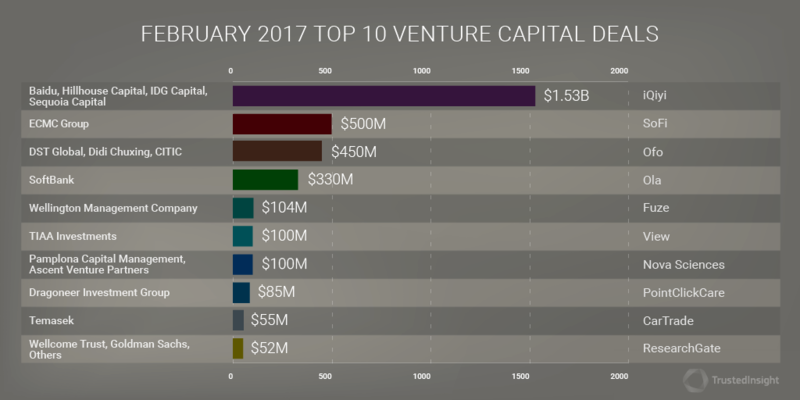 Here is a quick summary of the ten biggest venture deals closed in February.